After telling myself for the last two months that I would attempt to make my own gluten free flour blend – and then putting it off because every time I baked it seemed to be for an event and I didn’t want to serve up a gluten free disaster – I bit the bullet and bought some individual flours. It was actually quite spontaneous, as I had gone to the supermarket for ice cream ingredients and to replace the dismal biodegradable dishwashing detergent (Planet brand, FYI) for the better performing 7th Generation brand, and I was on my way to grab some bananas as I passed the health food section and the Bob’s Red Mill display caught my eye. Whole grain – brown rice, sorghum, millet, buckwheat, oat etc. White flours and starches – white rice, tapioca, potato etc. Nut – almond, coconut etc. Bean – chickpea/garbanzo, fava etc. The complete lists are on her website, and information is available on many other websites and articles about the specific flours. But the idea is that you need to replicate both the protein and starch content of wheat flour to succeed in gluten free baking. By following her guidelines of 40% whole grain flour blended with 60% white flour/starches, I subbed in flours that were both available to me at the time and that wouldn’t break the bank (the purpose of this venture being to save money), then experimented with recipes that had worked well for me previously with King Arthur’s GF flour blend. I found that the mix the Gluten Free Girl recommends was a little too heavy for light baked goods like cakes and scones but it worked well in pastries. 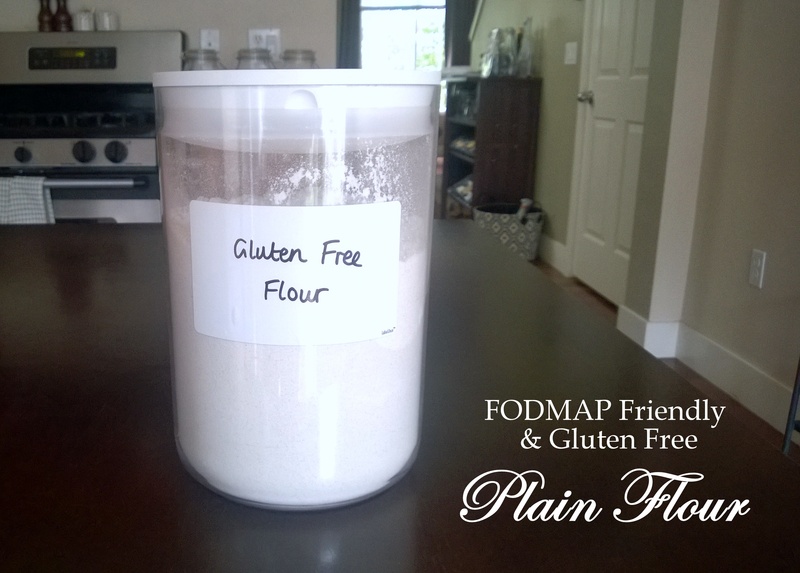 I will post my version of her recommended blend as another recipe – Low FODMAP and Gluten Free Wholemeal Flour. 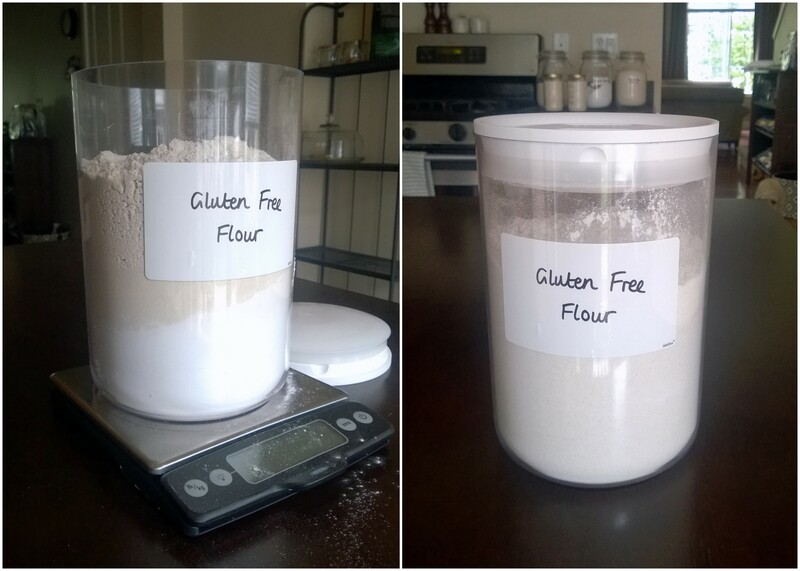 The specific blend I ended up using is somewhere between the Gluten Free Girl’s recommendation and King Arthur’s GF flour blend, which is my favourite pre-made blend available in Seattle. King Arthur GF flour goes for around $7/lb ($15.4/kg) on average – depending on the supermarket you go to. I buy spelt flour (which is NOT gluten free but can be made low FODMAP via fermentation) online for between $2.50-3/lb ($5.5-6.6/kg), which I think is reasonable, as a good wheat flour will cost almost that much, in Seattle at least. I can tolerate non-sourdough spelt products in small amounts but I don’t want to overdo it and end up reacting to it as well as wheat – it’s a sometimes food for me. So I still need a gluten free flour that performs well and falls within a certain price point. I would have been happy with under $4/lb ($8.8/kg) but I got this flour blend for around $2/lb ($4.4/kg)! That’s SO much cheaper than I had hoped for, and back in line with regular wheat flour’s price point. Anyway, this flour blend produced fluffy, moist and delicious banana nut muffins and carrot cake without any funny textures or bad tastes (bean flour, ugh, I can’t emphasise that enough). Next stop, testing it out on a pastry recipe! Brown rice is a contentious issue in the FODMAP world but Monash has it listed as low FODMAP (green light) in up to 1 cup servings, which, given it is only 20% of this flour blend and that you are unlikely to eat 5 cups of this flour, I think it’s safe. If you can’t tolerate brown rice flour, then buckwheat flour is a good alternative. Potato starch is different to potato flour. It is the starch of, rather than a milled potato (just as corn meal/flour and corn starch are different, even though in Australia corn starch is called cornflour – on this issue, I will admit we are wrong). White rice is low FODMAP in 1 cup servings. I do not include xanthan gum in this blend because I like to add that in separately for each recipe, adjusting the amounts based on whether it is a cake, biscuit/cookie, or more of a bread/dough. It really couldn’t be easier. Weigh each of the flours out and then mix them thoroughly, either by hand or with your stand mixer on a low speed with either the whisk or paddle attachment. Use either your stand mixer – which would ultimately do a much better job – and let it mix on the “stir” speed for 5 minutes. You could also weigh everything together into a container, close the lid and shake to mix thoroughly – but you will have to shake it for a while. I have tried this before and it’s a lot less reliable, as I don’t feel it mixes as well. To use this flour as a cup for cup replacement of wheat flour, you will need to add in xanthan gum, or a chia gel (1 tbsp. chia meal mixed into 1 tbsp. water). I didn’t add xanthan gum into the flour blend because the amount that I add to baked goods depends on what I am baking. This is a general guide, taken from the Bob’s Red Mill xanthan gum packet. I don’t always follow this exactly, as I don’t like the way that too much xanthan gum binds up a cake and makes it chewy. This blend is a “plain” or “all purpose” flour. Some recipes require a leavening agent, such as baking powder or bicarb soda, to allow the batter to rise. In this case, add the required leavening agent in at the time of baking, not into the flour blend when you first make it. This is because not all recipes want or need such additives – you wouldn’t want crepes that get fluffy! Store your flour blend in an air tight container and then boast to your friends the next time they scoff at expensive gluten free baking is that, actually, you mix your own flours and don’t pay much more than they do. Give them a nice, big grin as you do it. This entry was posted in Tips and Tricks and tagged all purpose flour, brown rice, brown rice flour, buckwheat flour, flour, FODMAP, FODMAPS, food, fructose friendly, fructose friendly flour, fructose malabsorption, gluten free, gluten free flour, healthy, home-cooked, homemade, homemade gluten free flour, low fructose, make your own gluten free flour, pastry, plain flour, potato flour, potato starch, rice flour, self raising flour, sorghum, sorghum flour, vegan, vegetarian, white flour, white rice, white rice flour, whole meal, whole meal flour. Bookmark the permalink.